Your Safer Neighbourhood Team (SNT) is a group of Met police officers dedicated to serving your community. The team is made up of officers based in Eastcote and East Ruislip, supported by additional officers from the wider area. The team works closely with local authorities, community leaders and residents to decide policing priorities for the area. This helps to find useful, long-term solutions to local problems, while maintaining a wider focus on reducing crime across London. 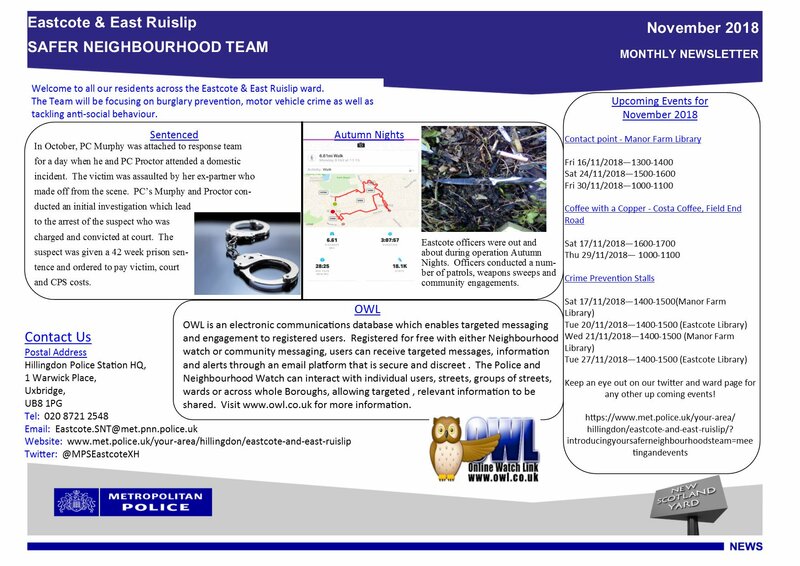 Each month, the Eastcote & East Ruislip Safer Neighbourhood Team produces a newsletter, which the ERA will post here for your convenience. For a handy guide on When to call Police, please click the link.